Day 1 | Arrival day. Group meeting at Mineralnye Vody Airport (MRV) at 13:00 / 1 PM Moscow time, and transfer to the hotel in Pyatigorsk city by RMH van (30 min.). Hotel check-in. Welcome briefing and orientation. Signing Waivers and required documentation. Gear check. Overnight stay at the hotel. Day 2 | Transfer from the hotel in Pyatigorsk to the North Side Base Camp – 2500 m. (4-5 hours drive). 1-hour light acclimatization hike through the valley to the Base Camp. Overnight stay at the mountain shelter at the Base Camp. the sea level. This place is considered to be a historical and religious spot of ancient monks. Descend to the Base Camp. Overnight stay at the mountain shelter at the Base Camp. Day 4 | Ascent to the High Camp at 3800 m. Overnight stay at the mountain shelter in the High Camp. Day 5 | Acclimatization hike to Lenz Rocks – 4800 m. Walking in crampons training. Basic snow & ice and rope training. Descend to the High Camp. Overnight stay at the mountain shelter in the High Camp. Day 6 | Rest day. Basic level self-arrest & rope training. Snow & ice training. Evening guides meeting with a group and client briefing. Overnight stay at the mountain shelter in the High Camp. Day 7 | Summit day. Elbrus Western Summit climb – 5642 m. Descend to the High Camp. Overnight stay at the mountain shelter in the High Camp. Day 8 | Reserve day in case of bad weather on the previous day / or descend to the Base Camp. Overnight stay at the mountain shelter in the Base Camp. Extra option: Paragliding in Elbrus Gorge. Day 9 | Transfer from the Base Camp to Pyatigorsk city (4-5 hours drive). Hotel check-in. Cultural program and sightseeing. Festive dinner. Certificates presentation. Overnight stay at the hotel. Day 10 | Departure day. Morning transfer at 10:00 / 10 AM from the hotel to Mineralnye Vody Airport (MRV). The North side of Elbrus is remote and there is no civilization around you. Climbing Elbrus from the North you get a touch of the wild. You spend 8 days in the backcountry in the pure Caucasus Mountains wilderness. The North Route of Elbrus is the route of the first ascenders. In 1829 on July 22nd, local Kabardian - Khillar Khachirov became the first human to climb Mt. Elbrus. It was the first ever scientific expedition to Mt. Elbrus organized and financed by the Imperial Russian army led by General Emmanuel. Elbrus climbing via the North Route is a good physical challenge even for trained and experienced climbers. Elbrus climbing via the North Route is a real adventure expedition in clean alpine style. Why climb Elbrus North Route with RMH? Our Base Camp on the North Side is equipped with a shower and toilets for your best relaxing experience. At Russian Mountain Holidays, we work hard to guarantee you the best possible Elbrus climbing experience to our guests and it is impossible when there are too many people in the group. That's why we keep our groups small. We close the booking when there are 8 guests in the group and work with a ratio of 1 Guide to every 3 guests on the Summit Day. At Russian Mountain Holidays, your Safety is our primary concern and do care about that. 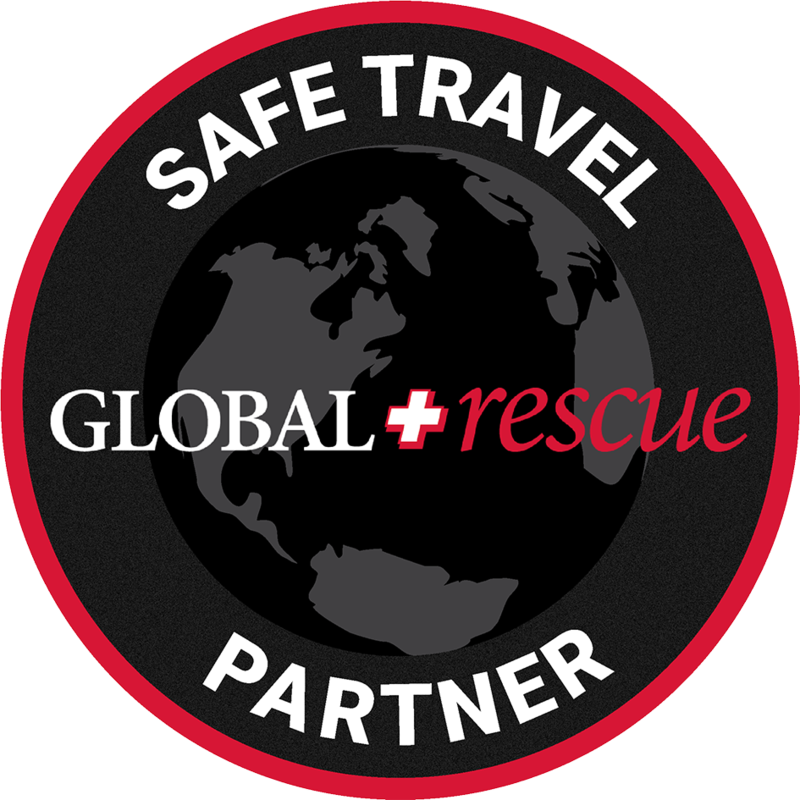 We register every group in the local Elbrus Rescue Service Department and operate in close cooperation with certified rescuers in every group. At RMH, we do care about your maximum comfort and provide you single occupancy supplement at the authentic Soviet hotel in Pyatigorsk, in the historic downtown of the city. Invitation letter for the Russian Visa. We email it to you immediately after we get your deposit payment and a scanned copy of your passport. 1. Mineralnye Vody Airport (MRV) — Pyatigorsk city (hotel accommodation) — Dhzily Su Base Camp. 2. Dhzily Su Base Camp — Pyatigorsk city (hotel accommodation) — Mineralnye Vody Airport (MRV). Accommodation in Pyatigorsk city. Authentic Soviet hotel in Pyatigorsk in the historic downtown of the city. Single occupancy supplement. Base Camp accommodation. Mountain shelter. Mixed dorm. High Camp accommodation. Mountain shelter at 3800 m. Mixed dorm. High-Quality meals. All meals during the entire trip. Cook. For the entire trip. Porters. For kitchen equipment and group food. Porter service for your personal equipment. Available for a small fee. Our RMH van departs from the main parking of Mineralnye Vody Airport (MRV) at 13.00 (1 PM). All guests are requested to arrive according to this time. If you arrive later, or much earlier, we can order you a taxi or organize a private transfer for you to Pyatigorsk. It is 30 minutes drive from the airport. Approximate price to get from the airport to the hotel in Pyatigorsk by taxi is about 30-50 EURO. In this case, we meet you upon arrival at the hotel. On the final day of the trip, our RMH van departs from the hotel in Pyatigorsk to Mineralnye Vody Airport (MRV) in the morning at 10.00 (10 AM) Moscow time. We can also order you a taxi or organize a private transfer for you from the hotel if your return flight departs earlier or much later. For climbing Elbrus via the North Route, RMH highly recommends that all guests have a complete set of their own personal climbing equipment! Some technical gear like boots, crampons, climbing harness and ice-axe can be rented in Pyatigorsk on the first day of the trip after your arrival at the hotel. We recommend that all guests have their personal current climbing equipment to ensure the best possible experience on Elbrus climb. In your personal climbing gear, you feel more comfortable during the entire climb and get the most out of it. However, some heavy technical gear such as boots, crampons, harness, and ice-axe can be rented in Pyatigorsk on the first day of the trip after your arrival at the hotel. Below we have listed the checklist of all the required equipment for your successful Elbrus climbing experience. Please, check it out and make sure that you already have everything that is listed below or let us know the list of items you need to hire in advance. You can also visit our Elbrus Climbing Equipment page for more detailed gear list with descriptions and good examples. Gore-Tex Jacket (an effective waterproof and breathable fabric. The uppermost layer of your clothing) — Check out this link to see how it works. Medically fit and physically trained for alpine climbing at high altitudes. We will need to have a look at your medical examinations, which should indicate that you have no contraindications to engage in this type of activity in the mountains and that you are completely healthy and in an adequate mental state. Alpine climbing or mountaineering always comes with a certain risk that we can’t completely control and is dangerous. Our job is to reduce this risk to a minimum as much as possible, but it’s still there as this is a wild nature. Climbing Mount Elbrus we spend 5 to 6 days in the backcountry. Buying this trip you have to understand and be aware of the seriousness of the Mount Elbrus climbing program and the possibility of the risk. Upon arrival at the hotel in Pyatigorsk on the first day of the trip, every guest will be asked to read and sign the RELEASE OF LIABILITY, WAIVER OF CLAIMS, ASSUMPTION OF RISKS AND INDEMNITY AGREEMENT.